How will this template help me? This template is designed to help you if you're an owner of a startup business or you're working with small businesses to help them develop their sales through a website, email marketing and social media. It can also be used if you're working at an established business and you want to review business or revenue model options as part of strategy development. This template is a one page summary you can fill in or discuss that will help you summarise the essence of your business: what it will offer customers, how you will make money and which partners will be important for you. The one-page format works really well for putting on a whiteboard or flipchart you can then snap. We're often contacted by owners of startup businesses asking for advice on launching a company online, or using digital marketing to support their offline sales. We also have members who manage agencies who work with startup businesses. What does the template include? 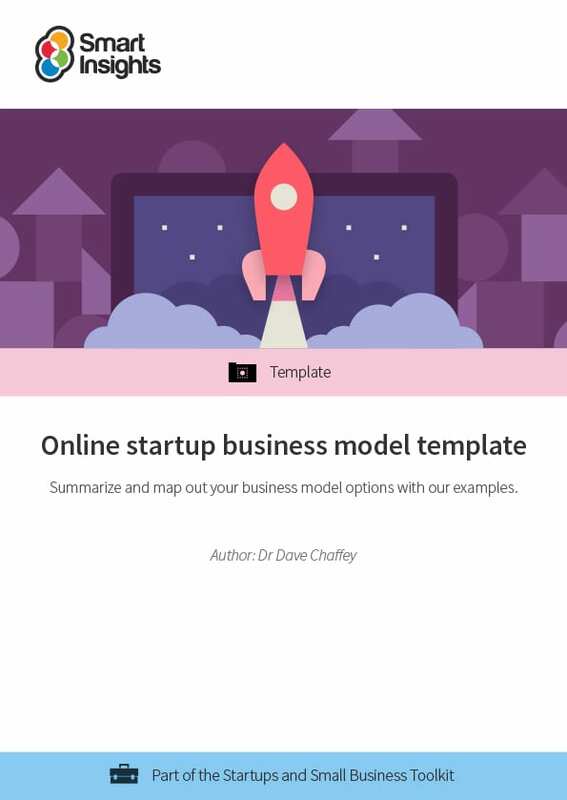 This is a short template with a single blank A4 business model template in Word landscape format. It also includes an example business model for the same company featuring in our example marketing plan template. We think this Business model format is essential for all startups to summarise their business and revenue models to present to their team, partners and investors. We use it ourselves at Smart Insights and regularly update it. Dave is co-CEO and co-founder of Smart Insights. He is editor of the 100 templates, ebooks and courses in the digital marketing resource library created by our team of 25+ Digital Marketing experts. Our resources used by our members in more than 80 countries to Map, Plan and Manage their digital marketing. Business members get full access to this and 7 other guides in the Startups and small business Toolkit.